I guess you could say I’m a pretty frugal person most of the time. I don’t like to spend money on new cars, expensive meals out, or lifestyle inflation. But, when it comes to spending money on experiences, making memories, or my boy-girl twins (the beans) I’m willing to make bigger investments here and there. To me, making memories with my family and taking care of the beans are the most important things in my life. This is how I choose to spend my money – not on “stuff” but on memories. With that said, when I got pregnant last year, I knew that I wanted the full experience of newborn photos and possibly even a birth video. I also knew that these things would not come cheap at all. In fact, paying for professional photography and videography is often one of the largest and most under-budgeted expenses for life events, like weddings and births. When I began looking for a newborn photographer, it was very tempting for me to try to be frugal about it. I wanted to get photos taken, but I didn’t want to spend the entire baby fund my hubs and I had saved up on photos. However, the more I looked at the differences between the “cheap” photographers and the top-dollar ones, I could see why some people chose to pay for the more expensive photographers. The photos were great quality and the kids didn’t look upset or stressed. I had a good friend of mine take beautiful lifestyle photos when the babies were born, and she gave that to us as a gift. I’m so grateful to her for that; however, I still wanted studio styled photos as well especially once the beans started to look more like nice, healthy plump babies. Because they were 5 weeks premature, it took them a while to get meat on their bones! So, I have some beautiful pictures of the early days, and then I also paid for a studio photographer to come to my house when my twins were two months old, and I’m so happy with who I chose. The total price worked out to about $600 and although it was expensive, it was worth every penny. Being a new mom is hard enough, and having twins right before having to move across the country for my hubs to continue medical school made it all the more stressful. The best part about the photographer we chose was how great she was with the beans. She was truly the baby whisperer. She made sure they were warm, relaxed, and comfortable. In fact, she was able to keep them asleep for the whole 5 hour session! It was truly a miracle. So to me, it was worth it to pay for a more experienced photographer because I knew she could handle taking the photos of two babies at one time. Plus I wanted to be happy with my photos for a lifetime, which I know I will be. In addition to having newborn photos taken, I also decided to have a birth video compiled. Birth videos are getting more and more popular these days. Videos are easy to share with friends and family who weren’t able to be with you for the birth of your baby for his or her first few days of life. Yes, photos can be used for this purpose too, but a video makes them feel even more a part of the experience. Plus, you can use a video to look back on your own birthing experience for years to come. Giving birth is an amazing, exciting, and somewhat stressful experience. The video, which you can see below, was created by the amazing Joy at Cher Bebe Birth Stories. For my birth video, some shots were taken prior to my c-section and others were taken during and after the arrival of the beans. If you are thinking of having a birth video put together, be sure to choose someone you trust and who will follow directions from you and your baby’s father if something were to change during the birthing process. I loved and trusted my birth photographer/videographer so much that she was the only other person in the room with me aside from my husband. 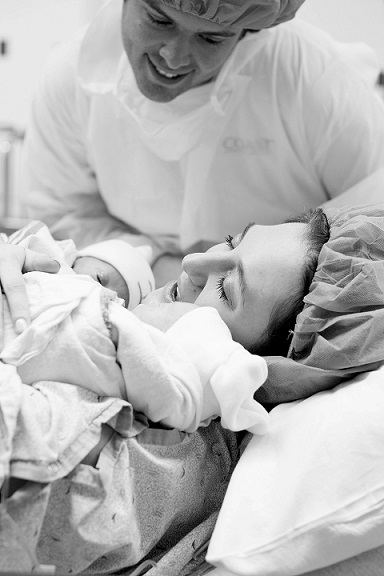 The price of a birth video is steep, even more so than photography most of the time. Most birth video packages start at around $500 but can go up to $1,200 or more. But again, it’s an amazing thing to have. Our beans don’t have a lot of toys. They don’t have tons of gadgets. They don’t even have a lot of clothes, but the things they do have are newborn photos and videos of the first few months of their lives, which are priceless. So, now that you know what newborn photography and videography can cost you (of course it varies by region), why should you hire these services done instead of DIY-ing it? • Hiring a professional ensures quality images. Professional newborn photographers and videographers have lots of experience with newborns and know the best way to dress them, pose them, and soothe them during the session. They also know which shots are “must haves” for newborn photo sessions. • Hiring a professional takes the stress out of it. Again, because of their knowledge and experience, hiring a professional to help with this special session will help ease your worry as a new parent. There are plenty of things to worry about, but your newborn photos/video should not be one of them. • Hiring a professional allows both mom and dad to be involved in the pictures. If you are DIY-ing it, it can be difficult to get yourself and the baby’s father in many of the images. Usually in DIY situations it’s either one parent or the other in newborn photos. It is much easier to capture a whole family photo with a newborn if a professional is running the camera. There are lots of areas in my life where I choose to be frugal; scrimping and saving to fit everything into our budget is my specialty. But, I knew that I didn’t want to miss out on the opportunity to document the beans as newborns. They are only newborns once, and it’s something I want to be able to look back on and remember forever. Luckily with these incredible newborn photos and videos, I can. Guest Contribution by: Catherine Alford is a freelance writing coach and blogger at www.BudgetBlonde.com. Photo and Video Credit: Joylynn Breaux at Cher Bebe Birth Stories. Follow Me on Social Media… Click one of the popular media links below. I can relate to the value of professional photography, When Mini Maroon 1 was born, we didn’t do official newborn pictures. I took a zillion as my very amateur self. I’m happy with them and was able to get some pretty good ones. When Mini Maroon 2 arrived almost two months ago, I decided I wanted to schedule professional pictures. Having settled into our maroon lifestyle, I bargain shopped. I found a woman for much lower than everyone else I saw. She was easy to work with, but I’m not crazy about the product we received. Respectable, but not great. Lessons I learned… Sometimes you get what you pay for – I know this, but let my wallet dictate this time. And if you want to take full family pictures with older siblings (2.5-year old, busy Mini 1), schedule two sessions – family and baby. We rushed through baby pics because Mini 1 was tired and ready to go home. Now we know should Mini 3 ever come along! Cat, I’ve seen your videos/pics on your site and absolutely love them. That gal did such a great job. When we had our kids we didn’t know such a thing existed, but if we did, we would’ve definitely spent the money on it. Aw thanks Laurie. They are some of my fav things ever! Gorgeous video!! I’d never really thought of a birth video and photos before, but, it totally makes sense and sounds like a great idea! How very special that your kiddos will be able to look back on these treasures when they’re older. So cool! Loved the video!! We had three kids years ago and hubby managed to be there for the two boys…our daughter , however, couldn’t even wait for the doctor much less her father!!!!! No professional photos there!! I was there when our daughter gave birth to our grandson. She had pregnancy pictures done and newborn shots as well that were so nice to have!!!! Cutest of them was a shot of her and the grandson, sitting on the floor with him resting hie head on her knees as she kissed him. We didn’t realize until we saw the proofs that he was yawning in the shot!!!! So cute!!!! Aw thanks — that sounds amazingly adorable. I love baby pics! I think it’s money well spent. I have a billion pictures of my kids as infants but we were in a financial free fall when they were born (2years of HB unemployment…during which we had two surprise pregnancies!) so we never did professional infant pics. It’s a regret I have and of course I can’t go backwards!! Totally worth it! My sister (the coach) took pictures of my daughter and I but I didn’t have professional pictures until my daughter was 10 weeks old. I understand the sentiment of newborn pictures. You forget certain things as you age and having these pictures keeps those memories alive. It’s true! They grow up so fast!